If You Don't Have An AR-15 Pistol Yet, Now Is The Perfect Time To Build One. At This Price There's No Reason Not To Add One To Your Arsenal. This Pistol Upper Kit, Once Assembled With Your Favorite Lower And Brace, Will Easily Fit Into Any Collection & Take Up Minimal Space. This .300 Blackout Assembled Upper Offers Amazing Stopping Power & Accuracy Which Makes It The Perfect Option For An AR Pistol. We Feel That This Amazing Blend Of Attributes Make This Kit Adaptable In Its Use And Ability To Be Used Anywhere Under Every Circumstance. Built On A Davidson Defense Upper Receiver Forged From 7075-T6 Aluminum. 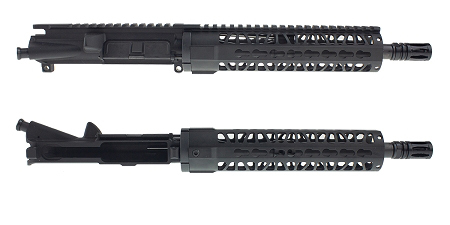 This Stripped Upper Is Precision Machined To Mil-spec M16/M4 Specifications And Features M4 Feedramps. This Build Features A 10.5" .300 Blackout Barrel From ELD Performance. This Barrel Is Made From 4150 CMV With A QPQ Nitride Finish And Comes With A Nickel Boron Extension. This Pistol Gas Barrel Has A 5/8x24 Thread Pitch And A Twist Rate Of 1-8. The Omega MFG. 9" Premium KeyMod Handguard Allows You To Comfortably Grip Your Rifle From Various Shooting Positions & Securely Mount A Variety Of Accessories. Made Of Aircraft Grade 6061-T6 Aluminum And Finished With Type III Mil-Spec Anodizing. 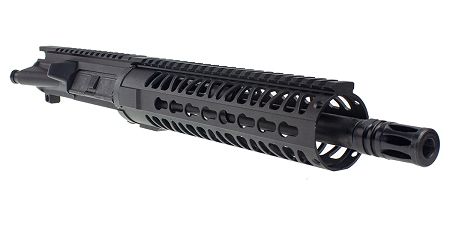 Includes A Mil-Spec A2 Flash Hider From Omega MFG. This Is The Best Working Flash Hider For The Money. If It Ain't Broke Don't Fix It Is The Old Motto. This Government Spec Flash Hider Is Designed To Disperse Gases & Direct The Flash Away From The Shooter’s Line Of Sight As Well As Help Manage Recoil.